It's often debated whether a classic novel would be published today. I think I can state categorically that 'The War of the Worlds' as written would not. Yes, this nineteenth-century novel is a classic of Science Fiction, perhaps the one SF novel that everyone, in the West at least, has heard of; it's been filmed, it's got its very own album, it's been endlessly reprinted, and you can download it for your Kindle for 94 pence. What can I possibly have against it? Simply this: the protagonist does not protag. It's striking when rereading 'The War of the Worlds' after so many modern SF novels to observe that neither the narrator nor his brother feels it incumbent upon them to do anything about the Martian invasion. Indeed, the narrator's ambition is to leave England until such time as it's safe to return, and his brother actually succeeds in doing so. True, the brother does help out a couple of damsels in distress, but it's notable that he saves them from other people, not the Martians. The narrator has some qualms about his (unnamed) wife, although not enough, perhaps, to give the scene that ends the novel much emotional impact. By and large, however, they are both primarily concerned with their personal safety. It's hard to see that going down well in the modern SF market, where the emphasis is very much on protagonists who are in the vanguard of the action, however reluctant they might be to act initially. In the 1953 film directed by Byron Haskin, the story was substantially changed overall, and, significantly for the purposes of this discussion, protagonist Dr Clayton Forrester was given a much more active role in trying to defeat the Martians. Like the original narrator, he observes the invasion, but, unlike him, he doesn't run off to whatever the equivalent of France would be in order to wait the conflict out. He tries to fight back with the weapon at his command--science. In Steven Spielberg's 2005 effort, protagonist Ray Ferrier is more in the vein of Wells' run-for-your-life narrator, but he has an excuse--he's encumbered by his two children. Throughout the film, everything he does is focused on keeping them, and particularly his daughter, played charmingly by Dakota Fanning, from harm. He may not defeat the Martians, but he does save his child. Wells' novel gives, perhaps, a glimpse of a Britain stratified by class and class roles that was weakened, if not entirely destroyed, by two world wars. I don't believe it's a novel that would have been written as it stands after the First World War; I don't believe it's a novel that then could have been written. The gentleman narrator is secure in his speciality of "speculative philosophy"; he's as much a soldier as he is a farmhand or a lord. It's simply not his role to get involved in fighting. This was obviously so well understood by Wells' readership that at no point does he need to explain why he doesn't volunteer for the nearest regiment. It just wasn't done. There's less excuse perhaps for the narrator's brother, who, as a medical student, might be thought to have skills that would be both necessary and useful in the conflict. Again, however, Wells doesn't defend his actions; indeed there is no recognition in the novel that they might need defending. Yet there are actions in the novel that the narrator feels require some defence, or at least justification--such as after he has stunned the raving curate and left him to be gathered up by the Martians. Such class security must have been destroyed in the First World War that so horrified Wells and undermined his belief in human progress towards a higher society that would have no use for war. In general, the novel seems structurally sound. 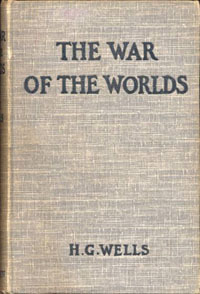 At the beginning, Wells introduces the idea of the "transient creatures that swarm and multiply in a drop of water", thereby foreshadowing the agents of the Martians' ultimate defeat. Interestingly, when used, slightly adapted, in the introduction of Spielberg's film, the "[n]o one would have believed...that this world was being wached keenly and closely by intelligences greater than man's..." line was laughable. This, from the man who brought us Close Encounters of the Third Kind? Please. It's bearable in the context of the novel, just. 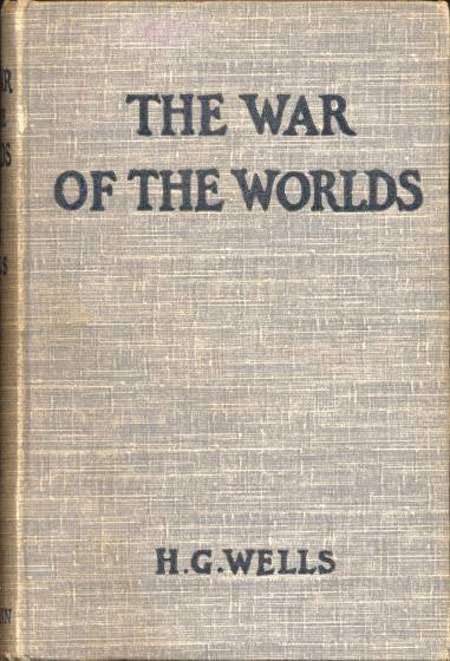 'The War of the Worlds' is an interesting title, especially given that all the novel's action takes place in the home counties and London. It's more like Mars versus the south-east of England. There's no suggestion that France will only be safe temporarily; this is very much an English war. Perhaps Wells also had two other worlds in mind: the macro world of the visible, and the micro world of the very small. In this particular conflict, of course, small succeeds where even the mighty Thunder Child, pride of the novel's navy, fails. "For, surging out beyond the white tumult, drove something long and black, the flames streaming from its middle parts, its ventilators and funnels spouting fire." A magnificent--and heroic--ending for at least one character in the tale. There's that old chestnut about the difference between American SF and British SF: that the former is a "fantasy of power," while the latter is a "fantasy of powerlessness." With this in mind, perhaps _The War of the Worlds_ fits the template, or even begets it. That's an interesting thought. The school of thinking wrt WOTW is, as I understand it, an attempt by Wells to defuse the Victorian English fantasy of power. So, intriguing! I don't want to defend WOTW too strenuously, because I agree with what you are saying. Still, it is kind of neat the way it defies expectations of "heroism" in fiction in favor of what might be termed stark cowardly realism. Putting it another way, from another angle: knowing the end of the story, that there is literally nothing humanity can do yet it will work out through the grace of God (or the luck of evolution), means that every word spent on trying to solve it would be wasted at best and more likely an abuse of the reader. In this light, WOTW is all about the terrible fear and the ignoble scrambling for self-preservation. Granted, even heroic fictions have a place for the "protagonist makes supreme effort, even though it fails" template, and I don't want to knock that, either, I'm just saying we agree that WOTW is non-heroic. Still, novels by Cormac McCarthy seem like big downers to me, so maybe WOTW would do well these days after all -- just not as "genre"! Heh. I agree that No Country For Old Men is a huge downer. I wanted to take it quietly back to the shop and return it. Not sure I would even call it non-heroic--more like 'defeated before you start'ist. After a while though I think heroic fiction can begin to pall. In a complex world it gets less and less believable that one small person can make a huge difference. Isn't there a bit in Foundation where they're trying to defeat Bel Riose by taking an ambiguous message to the Emperor and while they're bribing their way through endless layers of bureaucracy he's quietly defeated by the Forces of History? Is that an abuse of the reader? Interesting.